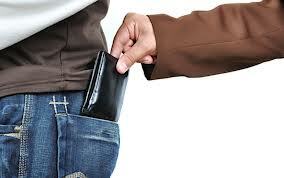 What’s up with pickpocketing in Spain? Look at any list of top pickpocketing cities and you’ll see that Spain usually snags two of the top spots, with Barcelona usually topping the list. It’s true; pickpocketing is a problem here in Spain and one that doesn’t seem to be improving (mainly because of the lack of punishment in my opinion as a thief can pay a fine and be back on the street hours later). If you live here, you have to accept that pickpocketing is a risk and know how to be cautious. On the other hand, what you don’t see as much here are crazy US-style gun-related shootings like the recent police officer shooting in the back of an unarmed man in South Carolina or school shootings. Of course there’s violent crime, but I would say that here in Spain it’s much more likely that you’ll discover your wallet’s suddenly missing without having any idea how/when it happened than see a gun. So… what happened to me? 1. The metro. One day, less than a year after moving here to Madrid, I got off the metro that my wallet was gone. Stupidly, I thought maybe it had fallen and ran back into the metro station to basically have the security officers laugh at me when I asked if anyone had turned in a wallet. 2. The ATM. To make a long story short, two young girls (who I later found out were very well-known to the police and had been doing the same scam for a while) came up behind me while I was alone using the ATM (at an extremely busy intersection in the middle of Madrid, Avenida de America, during daylight) and started banging like crazy on the machine and yelling at me to scare me. Sounds crazy? What’s crazier is that there was a defect with the ATMs at that time that caused that excessive banging to spit out 300€ from that person’s account a few minutes after the person got their card back. So I was able to get away shaken and later found 300 euros missing from my account. Fortunately I was able to get it back from the bank. What’s my take on all of this? Should you walk around in Spain being paranoid? No. However, you definitely have to be cautious knowing that it’s a common problem. It sounds cliche, but the phrase “don’t leave your items unattended” really is something to go by. And I would add, “keep an eye on your items”. If you’re using a bag, make sure the zipper is where you can see/touch it, and just keep an eye open. If you’re traveling, use one of those body security belts that you probably think you don’t really need. And if you’re here on vacation, no need for flashy jewelry; it’s just not common here. So, what’s better: prevalent professional pickpocketing or prevalent guns in the hands of everyday people? I’m not sure if there’s really a winning answer here, but I have to say that I do feel safer living in a country where not any Joe Schmoe can own a gun. However, I’d feel even safer if the government finally realized the need (and benefit) of implementing more severe punishments for robbery. Time will tell. This entry was posted in Life in Spain, Miscellaneous and tagged Pickpocketing, Robbery, Saftety on April 9, 2015 by Michelle.